AT-4020 is a specially formulated adhesive for holding all our parts with little or no sagging in vertical or overhead applications. Cures in 10 - 12 minutes and has working strength within 40 minutes. 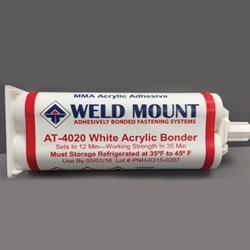 AT-4020 is recommended for composite and plastic bonding applications and not for bonding to metal substrates. Unlike other 2 part acrylic adhesives AT-4020 has a one year shelf life when stored at 72 degrees but is best refrigerated when ever possible. It is packaged in a 50ml cartridge and can be mixed by hand or by using our AT-300 gun and mixing tips. The 50ml cartridge will bond 150 –200 parts.